How to Cheat in Golf – Confessions of the Handicap Committee Chairman is a light-hearted treatment of a serious subject. In his discussion of cheating on and off the golf course, author (The Man on the Bench) h. Alton Jones identifies numerous techniques golfers use to game-the-system. In the past, exposing the sandbaggers hasn’t been an easy task. Jones has developed and explains a number of techniques that can make it easier for golfers to identify and expose those who seem to win over and over again while defying the odds. It’s a fast and easy read that will appeal to every golfer who has ever lost a nickel on the course. It makes a great gift for your golfing partner, the Handicap Committee Chairman or the District Attorney. 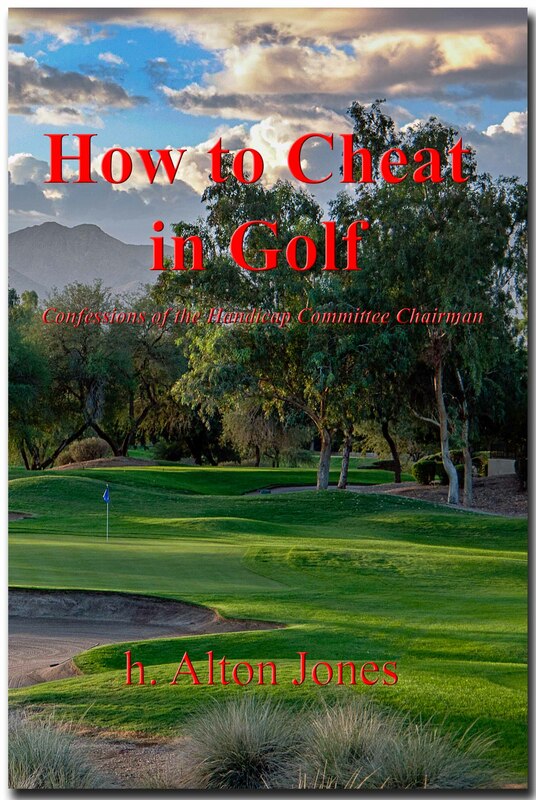 How to Cheat in Golf – Confessions of the Handicap Committee Chairman is available through Amazon.com, BarnesAndNoble.com and other fine booksellers in the United States and Europe. The entire USGA Handicap System is predicated on the concept of “peer review”. This is a euphemistic term that loosely translates into “checking on that S.O.B. to make sure he’s posting his scores correctly.” Historically, “peer review” has been done by checking the posting sheet in the locker room or wherever your club hangs it. This can be problematic because the S.O.B. may not post until the following day or maybe a week later. It may also be difficult if the club picks up the sheet every day to make entries into the handicap system. And of course, it’s hopeless in cases where the S.O.B. plays a foreign course and posts six 95’s accidentally. With the advent of electricity (thanks to Ben Franklin), we now have computers. You can get on and double-check the postings of not only that S.O.B., but even honest, nice guys like myself. Not only “can you”, it’s your responsibility. It called “peer review”. Admittedly, it can still be difficult when the S.O.B. spends part of the year in Canada or Europe where the exchangeability of data between the USGA’s “ghin” system and their barbaric, underdeveloped handicap posting systems run in a dank, dark room with a computer driven by a hand-crank (do they have electricity in Canada?). But in the enlightened world, it can be done from the comfort of your home with a good, peety scotch in hand. In the past, in an effort to assure a higher level of compliance with USGA handicap rules, team “captains” have been encouraged to post the scores of all members of their teams following golf rounds. Although the intent is noble, the result is not. Team “captains” should be encouraged to “encourage” teammates to post scores. If necessary, I have no problem with them yelling, berating and sarcastically demeaning their teammates to get them to post. Threats of physical violence are fine with me, but the individual players should post their own scores . . . post them correctly and post them all. Here are my reasons. Page One of the USGA Handicap System manual couldn’t be any clearer. Two basic premises underlie the USGA Handicap System, namely that each player will try to make the best score at every hole in every round, regardless of where the round is played, and that the player will post every acceptable round for peer review. There are no provisions in the manual for surrogates, babysitters or house mothers. It’s the golfer’s responsibility – end of story. With captains or scorekeepers posting rounds, confusion and errors are inevitable. An increasing number of players prefer to post their own scores online. Without question there will be duplicate postings. Unfortunately, these duplicate postings are not always detected in a timely manner and having them eliminated is problematic. The golfer must call the club, explain the situation, ask that the duplicate be removed and hope that the process is completed successfully and without error. Also, it is not unreasonable to conclude that with human nature the way it is, some golfers’ abilities to detect and correct duplicates are no doubt greater when the scores are very low. High scores are going to be thrown out anyway aren’t they? Not exactly mathematically valid reasoning. The converse to #2 above is also true. If the golfer assumes the captain will be posting and the captain fails to post for whatever reason, a handicap lowering 75 may be overlooked and go unposted. Not all captains fully grasp the concept of equitable stroke control (ESC) and know how to properly apply it. Depending upon a golfer’s handicap range, he may not take a score above a certain number. When posting scores, adjustments MUST be made prior to posting. Otherwise, the handicap system does not function as intended. It is also true that the team captain has just arrived at the club house after a grueling round in 110° heat and has not only his own score to review for adjustments, he now has three other scores to check and double-check. He’s thirsty, damn thirsty and the Member’s Grill calls out his name. How much time and effort do you really think he’ll be investing in reviewing postings for ESC? The fifth and final reason for arguing against placing an intermediary in the posting process is perhaps the biggest one. It gives the “shady guys” (you know who you are) ground cover when they’re reviewed by the Handicap Committee. “Well, I didn’t post that score because the team captain was supposed to do it. It’s not my fault.” Yes it is. Read the USGA manual. But when we put the burden on someone else’s back, we confuse the situation at the least or worse yet, we give the bandits cover for their crimes of neglect or intent. And then we wonder why some guys seem to always play below their handicaps when the stakes are higher. Go figure! In the past week, I’ve had one duplicate score posted by a team captain. It has been corrected, but not without spending a little time and a little effort. If the old system of captain postings remains in place, please take note of my personal request – DON’T POST MY SCORES. When I am a team captain, I will not post yours. I will give you your adjusted score and growl at you to post it yourself. If you don’t, shame on you. Perhaps I’ll see you in a meeting of the club’s Handicap Committee the week before one of our big tournaments.